Heat half the oil in a large frying pan over medium heat and cook mince until brown. 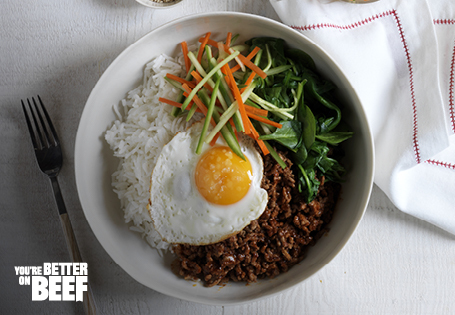 Reduce heat to low, add soy sauce and chilli paste and stir until combined. Check seasoning, add more paste if desired. Place carrot and cucumber in a medium bowl with vinegar, sugar and a pinch of salt. Allow to pickle for 10 minutes. Wash baby spinach, drain and place into a hot dry pan or wok and stir until just wilted. The water clinging to the leaves will be enough to soften them. To serve: divide steamed rice between serving bowls and arrange the ingredients carefully on top. Finish with the egg and the chilli paste, and sesame seeds, if using.